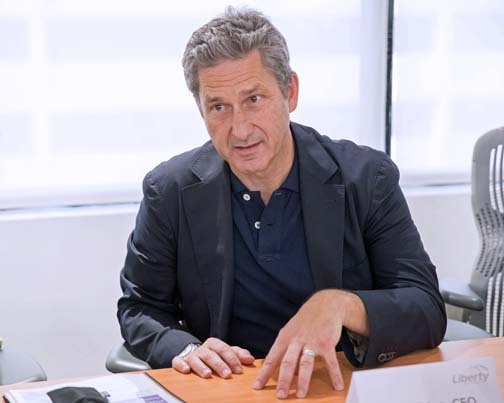 Liberty Global CEO Mike Fries said Thursday although Hurricane María is not the first experience the provider has had with storms, this one is the worst it has experienced in 25 years of presence in Puerto Rico. “It was an islandwide event, devastating to infrastructure, communities and lives, and we’re here to repair that,” he said, during a roundtable with members of the island’s media. “We have a lot at stake here. It’s an important market for us, where we’ve been for decades. We’re not going anywhere; no chance,” Fries said. Liberty Puerto Rico’s islandwide infrastructure sustained severe damage in the wake of the hurricane that made landfall on Sept. 20 — exactly one month ago. “The damage to the network infrastructure is an important thing, but the damage to communities and lives is far more important, and that has been devastating,” he said. The provider’s network, he said, is “in a difficult place.” Liberty Puerto Rico has some 400,000 customers signed up to its internet, television and voice services, most of whom as of today are not getting any service. “If 90 percent of the island is without power, it means most of our customers are without service,” Fries said. “We’re really anxious to resume business. We’re somewhat dependent on the power company. But as soon as they turn the lights on, we’re right behind them,” said Fries. “Sometimes we’re in front of them, and we’re hopeful we can accelerate the pace of restoration and really bring the communities back because the networks are an important part of the community, and once we light those up it’ll be a positive thing, but that won’t solve everybody’s problem,” he said. Although Liberty has an estimate of how much it will have to invest to restore its Puerto Rico operations, Fries refrained from revealing the figure, saying it should be made public sometime next month. Liberty Puerto Rico has about 950 employees, all of whom are working. Naji Khoury, president of Liberty Puerto Rico, has “in a very smart way redeployed people who are not doing their normal jobs because we don’t have customer service, and getting them involved in other areas of the business that need help,” Fries said. “We haven’t let anybody go,” he said. The extent of the damage to Liberty’s infrastructure is such that it will likely have to double the number of work crews it has doing repair work to 100 by the time it is done, Khoury said. Liberty’s local network is mostly comprised of fiber optic cables that merge into the electrical grid via coaxial cables, which go into neighborhoods and houses. “The issue is that there’s a point where that translation from light to electrical where the power becomes a necessity,” Khoury said, adding Liberty’s fiber optic network is almost 100 percent up, and should be ready by next week. “Once we do that, as power comes up, we connect. Areas that have severe damage will take longer because they need to have power,” he said. The executives admitted to the possibility that Liberty may not be able to go back to all of the areas it served prior to the storm. “There are so many variables that don’t depend on us — in the end, the sad part of this story is that people may no longer live in those areas anymore,” he said. Meanwhile, Fries said Liberty is not at a point yet where it can identify every community, every part of the network, how long it will take and how much it will cost to repair. As part of its commitment to Puerto Rico, Liberty has launched its own humanitarian relief effort, which has already raised $1.5 million to provide support in the local community beyond what is happening in its network and business. “And we’ll keep doing whatever we can with Naji’s support and advice to ensure that we’re helping people get their lives back,” Fries concluded. Hey Buddy!, I found this information for you: "Liberty Global CEO: ‘We’re here to repair network, lives’". Here is the website link: https://newsismybusiness.com/liberty-global-network/. Thank you.